You have already purchased this music, but not yet printed it. This page is just a preview and does not allow printing. To print your purchase, go to the My purchases page in your account and click the relevant print icon. Buy this score and parts now! You have already purchased this score. To download and print the PDF file of this score, click the 'Download & Print' button below. The purchases page in your account also shows your items available to print. This score is available free of charge. Just click the 'Download & Print' button below. Which method of viewing music should I use? You do not need to install any additional software to use seView. Scorch is a free plug-in from Avid for displaying and printing music. It can also play the music that you're seeing. As modern web browsers are updated, Scorch is no longer compatible with many browsers. Scorch has never been compatible with mobile devices and some web browsers on Mac computers. If your web browser does not install Scorch automatically, you can click here to download and install scorch manually. The static preview shows a basic image of the first page. The interactive preview also shows a preview of the first page, but it's a bit slower to load. The preview is displayed using the Sibelius Cloud Publishing technology from Avid. With most scores, this technology will provide a higher quality preview, as well as being able to switch to full screen mode and also play the displayed music to you. After you have purchased this item the Cloud Publishing technology is utilised to provide the printing mechanism for the music. As such, we recommend checking that the Interactive Preview displays correctly on your device before committing to a purchase. It looks like you're using an iOS device such as an iPad, or iPhone. Unfortunately, the printing technology provided by the publisher of this music doesn't currently support iOS. After making a purchase you will need to print this music using a different device, such as desktop computer. This preview of this score only shows the first page. There are 3 pages available to print when you buy this score. this music. Be sure to purchase the number of copies that you require, as the number of prints allowed is restricted. You have already purchased this score. 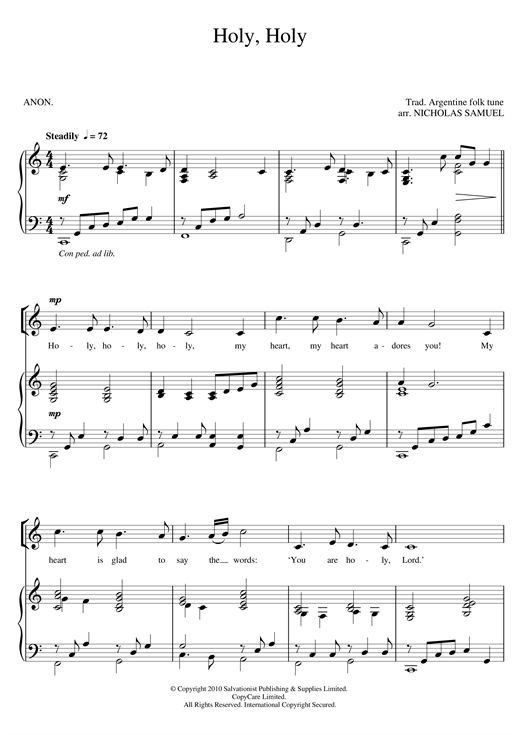 To download and print the PDF file of this score, click the 'Download & Print' button above. The purchases page in your account also shows your items available to print. This score is available free of charge. Just click the 'Download & Print' button above. For anything not permitted by the above licence then you should contact the publisher first to obtain permission. In order to submit this score to ScoreExchange.com has declared that they own the copyright to this work in its entirety or that they have been granted permission from the copyright holder to use their work. If you believe that this score should be not available here because it infringes your or someone elses copyright, please report this score using the copyright abuse form. I certify that this review is based on my own experience and expresses my own genuine opinions. I have confirmed that this review meets all the criteria for reviews on Score Exchange and I understand that Score Exchange has a zero-tolerance policy on fake reviews. The PDF of this score should now start downloading automatically. If this doesn't happen you can use this link to manually download the pdf. All content on Score Exchange is priced is US dollars. However, for your convenience we can also display prices (and you can pay) using British Pounds Sterling (GBP) when your payment is via credit/debit card or via PayPal.